Latinos generally agree that improving the educational system, defending the country from future terrorist attacks and strengthening the U.S. economy should be top priorities for the Trump administration and Congress in 2017. A smaller share of Latinos say dealing with health care costs and the issue of immigration should be a top priority, though views on immigration as a priority vary by legal status and party affiliation. Roughly three-quarters of Latinos (73%) say improving the educational system should be a top priority for Trump and Congress in 2017. Other top priorities include defending the country from future terrorist attacks (69%) and strengthening the nation’s economy (66%). A smaller share of Latinos say reducing health care costs (54%) should be a top priority for Trump and Congress. Dealing with the issue of immigration is the lowest-rated issue for Latinos among those tested in the survey, with about half (46%) saying it should be a top priority. Immigration was not a top issue among Latinos in past Pew Research Center surveys, either.5 In fall 2016, 87% of Latinos rated education as “very important” to their vote, followed by the economy (81%), health care (80%), immigration (72%), terrorism (71%), how Hispanics are treated (71%) and gun policy (59%). As Barack Obama was taking office as president in 2009, 57% of Latinos said the economy was an “extremely important” issue facing the incoming administration, followed by education (51%), health care (45%), national security (43%), the environment (33%), immigration (31%) and energy policy (20%). Among the U.S. general public, a Pew Research Center survey from January found that 76% say defending the country from future terrorist attacks should be a top priority for Trump and Congress in 2017 and 73% say the same of strengthening the nation’s economy. Other top priorities include improving the educational system (69%), improving the job situation (68%) and reducing health care costs (66%). Dealing with the issue of immigration is rated lower, with 43% saying it should be a top priority for Trump and Congress in 2017 – similar to the share of Hispanics with this view. Overall, the ranking of issue priorities is similar among U.S.-born Latinos and immigrant Latinos. Education is seen as a top priority by both groups, for example, as are the economy and terrorism. Among U.S.-born Latinos, 77% say improving the education system should be a top priority for Trump and Congress in 2017, followed by strengthening the nation’s economy (71%) and defending the country from future terrorist attacks (70%). Lower priorities among those tested include reducing health care costs (57%) and dealing with the issue of immigration (39%). 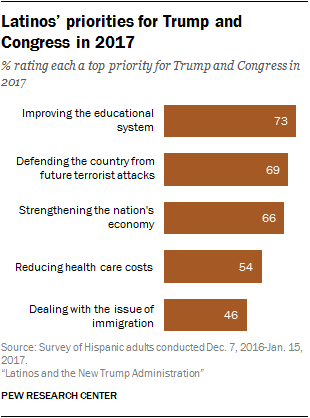 Among foreign-born Latinos, top priorities for Trump and Congress include improving the educational system (69%), defending the country from future terrorist attacks (68%), strengthening the nation’s economy (62%), dealing with the issue of immigration (52%) and reducing health care costs (51%). While U.S.-born and immigrant Latinos share a similar set of issue priorities, there are differences among immigrant Latinos that are linked to their legal status. The top three priorities of Latino immigrants who are U.S. citizens and Latino immigrants who are lawful permanent residents are similar to those of U.S.-born Latinos, though the groups rank these priorities differently. Among Latino immigrants who are U.S. citizens, 74% say improving the education system should be a top priority for Trump and Congress; other top priorities include defending the country from future terrorist attacks (70%) and strengthening the nation’s economy (69%), followed by reducing health care costs (58%) and dealing with the issue of immigration (48%). 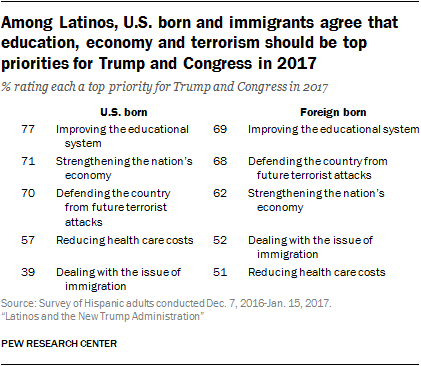 Similarly, top priorities for Latino immigrants who are lawful permanent residents include defending the country from future terrorist attacks (74%), improving the educational system (72%) and strengthening the nation’s economy (67%), followed by dealing with the issue of immigration (47%) and reducing health care costs (43%). Among Latinos who are likely unauthorized immigrants – i.e. those who are neither U.S. citizens nor lawful permanent residents –improving the educational system (61%), dealing with the issue of immigration (61%) and defending the country from future terrorist attacks (60%) are among the highest-rated priorities. Other priorities include reducing health care costs (52%) and strengthening the nation’s economy (49%). While there are no partisan differences among Hispanics when it comes to the relative importance of health care, immigration and education as national priorities, Republican, Democratic and independent Latinos do place differing degrees of emphasis on national security and the economy. About eight-in-ten Latino Republicans (82%) say defending the nation against future terrorist attacks should be a top priority for Trump and Congress in 2017, compared with 70% of Latino Democrats and 65% of Latino independents who say the same. When asked about strengthening the nation’s economy, 83% of Latino Republicans say it should be a top priority, followed by 70% of Latino Democrats and 61% of Latino independents. On improving the educational system, about three-fourths of Latino Republicans (74%), Democrats (75%) and independents (73%) say it should be a top priority. Regardless of political party affiliation, Latinos place a lower emphasis on immigration than on some other issues. About half of Latino Republicans (53%) say dealing with the issue of immigration should be a top priority for Trump and Congress, as do 45% of Latino Democrats and 46% of Latino independents. Latinos generally rank the issue of immigration as a lower priority than other top issues for Trump and Congress in 2017. However, the percentage of Latinos who say immigration should be a top priority varies across some demographic subgroups. Among Latinos born in the U.S., 39% say dealing with the issue of immigration should be a top priority, compared with 52% of foreign-born Latinos who say the same. 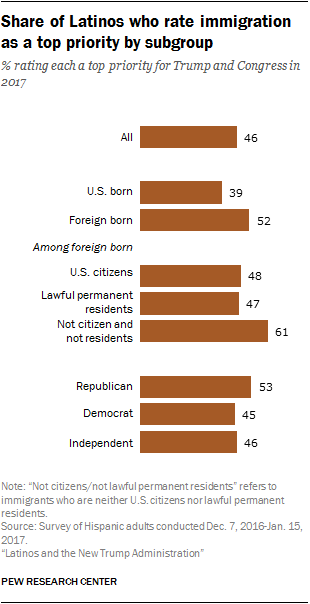 Among foreign-born Latinos, 48% of those who are U.S. citizens say immigration should be a top priority, as do 47% of lawful permanent residents and 61% of those who are neither U.S. citizens nor lawful permanent residents. Among Latino Republicans, 53% say immigration should be a top priority, compared with 45% of Latino Democrats and 46% of Latino independents.